Belgian cyclist Johan Vansummeren said he will race this Sunday, seven days after a terrifying crash with a spectator that left the 65-year-old woman with a severe brain injury. The accident occurred during last weekend's Tour of Flanders. The woman, Marie-Claire Moreels, was standing on a traffic island as the peleton swept by on both sides, when Vansummeren struck her head-on, knocking her out of her shoes. Jesus. There's video, if you're so inclined, but please note that it might be disturbing. The crash happens at 0:14. 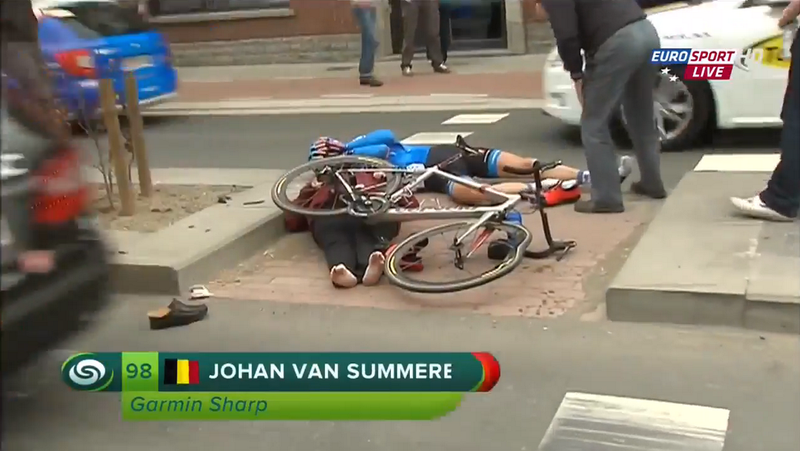 Vansummeren was largely uninjured. "I am in shock," he said after being released from the hospital that night. (There's a photo of the injured spectator at that link, so heads up.) "I have a black eye and a few stitches, but that's not important now. I feel bad for the people involved." The spectator, Moreels, was placed into an induced coma and has undergone two surgeries on her brain. She is reported to be in critical but stable condition. Spectators have said there were no flags or officials to warn riders of the traffic island, and authorities have opened an investigation into the crash. "Was the lady allowed to stand there? Or was it the rider that made the wrong manoeuvre? We have to investigate all this, using the accounts of witnesses, the statements made by Mr Vansummeren and the amateur video that you have probably seen", explained Tom Janssens on behalf of investigators. It is reported that they will also examine how much warning the riders had been given of presence of the pedestrian island. "We don't blame Johan Vansummeren," said Moreels's husband. "It was an accident. It all happened so fast. He saw Marie-Claire too late." Vansummeren will start Sunday's Paris-Roubaix race, with the blessing of Moreels' family. "Even better," said her husband, "he could win and dedicate it to Marie-Claire."